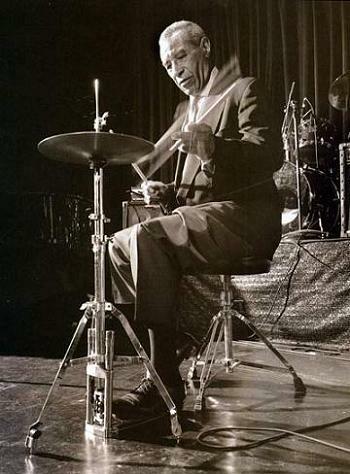 Born in 1924, Max Roach is one of the pioneers of bebop drumming with Kenny Clarke, Art Blakey and Buddy Rich in the 1940's. Master of brushes, improvisation and melodic playing (he is also a pianist), the binary fast bop chabada (which he may perhaps be the inventor), he was one of the first to adapt brilliantly Brazilian and Cuban percussion on drumset (the "Latin" jazz, at the same time). 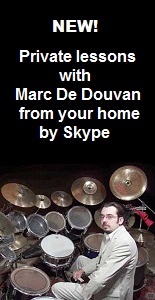 He is also one of the first to play long solos on stage and even to do solo concerts (which I had the chance to see one in Paris), bestowed the drumset its honour (with notably feet ostinatos in 3 or 5 beats in independence with an improvised hands playing, concept echoed by today's best soloists, all styles condidered). He is known to be able to captivate his audience with a whole piece only with the snare or the hi-hat, putting it then in front of the stage (some great art!). He claims the influence of "Papa" Jo Jones, but has his own style. He will record a famous "drum battle" duo with Buddy Rich, often considered as the greatest virtuoso drummer in history, without being crushed at all ("Rich Versus Roach", 1959). Constantly renewing, he will participate in the second revolution of jazz that constitutes the free-jazz (the first being bebop). His duo form with the saxophonist Archie Shepp remained in the annals ("The Long March" 1979) like the "unhoped" trio with Duke Ellington and Charlie Mingus ("Money Jungle" 1962), a summit of listening and creativity in jazz. He died in 2007 at the age of 83. This is one of the last representative and creators of "traditional" jazz, who leaves us.